Are you finding an online store for selling music equipment, computer, jewelry or sport accessories? We would like to introduce you SM Moza theme – Multi-store Magento theme that is perfect choice for you. SM Moza has a fully responsive layout that extremely beautiful on mobile and tablet devices and lots of other awesome features that will make your store become powerful. SM Moza would be a great for music equipment, computer, jewelry or sport store…you also can easy to customize for any product range. Along with the default music store, we also designed 3 different stores. They include: Computer store, jewelry store, and Sport store. SM Moza is designed with 5 Preset Color Styles: Orange (default), Blue, Green, Cyan, Red. Besides, this theme gives you the full control in customizing color schemes in back-end. You can also totally change your color for all params: body, header, spotlight, footer… by using c-Panel. 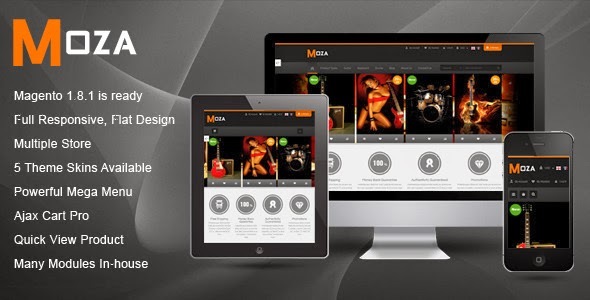 SM Moza will make you satisfied with the responsive function that automatically resize its layout to screen size and adaptive with various styles such as: mobile, iPhone, iPad and other tablets. SM Moza supports 3 types of menu: Super Mega Menu or Simple with Css Menu, Split Menu. With our mega menu, you can add multi-category, multi-product with description, price, image, video, effects… or even static blocks, modules. By using Powerful Slider, your featured products will be shown more beautiful with the necessary information like images, titles, brief descriptions and nice slider effect. This theme supports 2 types of layout. You can change view easily by the Grid and List button. It’s so convenient for customers to view quickly product detail on the Homepage, Listing page without leaving the current page. Your product detail will open with full necessary information like: image product, product price, description, product reviews, product attributes and link to the product detail page, etc. You can turn on/off “Quick View” option easily in the Admin Panel. SM Moza uses SM Tab Listing to display all products according to category or product order. You can easily and quickly show your products more attractive on the homepage as well as help your customer save time without wandering to look for information. Just click “Load more” button, the list of more products will be loaded and appeared in short time. You can add products to Cart, Wishlist & Compare in a single click, without leaving the current page. Allow visitors to add quantity of products to the cart without redirect to the checkout page. It also allows your visitors to remove products from the cart. Support layout on top and left or right hand slide. With our static blocks, you can easily and quickly create your attractive blocks. They can be a free shipping box, social box, gallery box… that all depends on your wishes. This is an interesting feature for your Magento stores. This helps you to provide official information about store news, upcoming products and promotions to your customers. Image- Popup: Allow customer to quickly view a full product image on the fancy box popup. Releated Products Slider: Allow you to showcase your products in categories with product images, descriptions and more as well as access detail product page to purchase these items. SM Moza offers users 6 different types of product profile to choose from. You can select an appropriate one for different products to sell the products. Item Reviewed: New Multipurpose eCommerce Responsive Magento Theme 9 out of 10 based on 10 ratings. 9 user reviews.